T.W Bache purchased Bailey & Mackey in 1946, they were based in Great Hampton Row, Birmingham, and manufactured door knobs using its own brass foundry and workshop. This was soon developed when the company realised the set up was ideal to manufacture pressure gauges. This was expanded in 1956 with the introduction of pressure switches and the first Furnace was purchased in 1959 to enable to manufacturing of Hardened and Tempered Steel Diaphragms. Several large orders where soon placed by the Indian Railways for Vacuum Pressure Gauges but with unusual specification of 6” iron cases and steel rims so they could prevent the theft of the internal Brass. In 1971 25 Years was celebrated and shortly after in 1979 Mr.T.W Bache sadly passed away. The first transducer came out in 1982 which meant Bailey & Mackey was now manufacturing a complete range of pressure sensing instruments. In August 1987 the company was restructured, with five directors now having shares in the business, and 15 employees were presented with gold watches to acknowledge their 25 years’ service. 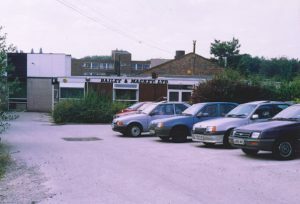 An increase in business enabled the purchase of new premises in a vacant lot next door and a new assembly and office space was built which was opened in 1995. This tripled potential capacity. 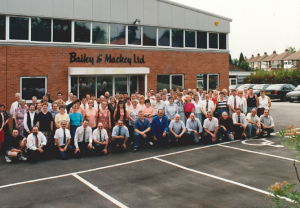 Bailey & Mackey celebrated 50 years in 1996 and continued to invest in the plant and machinery, moving from manually operated machines to CNC machines. In 1999 the company was bought out by Eric Sparks who became the sole owner of Bailey & Mackey. Soon after this a second unit was purchased to increase the capacity on parts manufactured, located in the nearby town of Walsall. The satellite building has two more CNC machines and a backup assembly section. 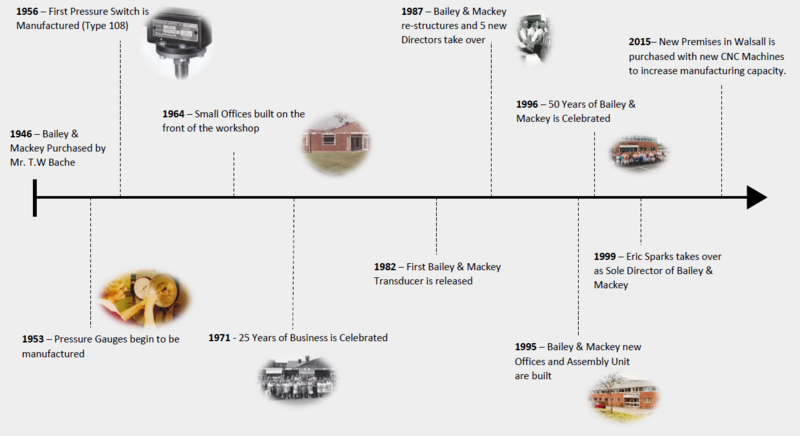 Today, Bailey & Mackey is still working from these offices and enthusiastically approaching 75 years of business and is looking forward to the future. They continue to maintain the Philosophy of working closely with current and new customers to produce high quality and reliable products in an ever changing industry.